German Chocolate Truffles have the signature taste of coconut, toasted pecans, and brown sugar in a luscious, chewy filling encased in dark chocolate. I think these taste best when covered with real chocolate, but I recommend tempering the chocolate if you use it, so that it remains shiny and stable at room temperature. If you melt the chocolate without tempering, consider storing these in the refrigerator so the chocolate stays hard and shiny. Just be sure to serve them at room temperature so the filling is nice and soft. 1. Place the butter, sugar, and corn syrup in a small saucepan over medium heat and stir until the butter and sugar has melted. Bring the mixture to a boil. 2. Once boiling, add the flour and continue to cook and stir for one minute, until the mixture thickens. 3. Remove the pan from the heat and stir in the pecans and shredded coconut. Set the mixture aside until it cools to room temperature, about 30 minutes. You can speed up the process by refrigerating it for about 15 minutes until it is cool but not hard. 4. Scoop the mixture with a candy scoop or a teaspoon and roll it into balls between your palms. 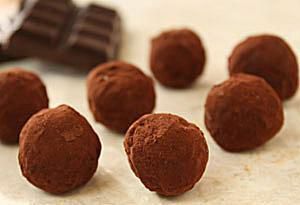 Set the balls aside while you prepare the chocolate for dipping. 5. Place the chopped chocolate or chocolate coating in a microwave-safe bowl and microwave until melted, stirring after every 30 seconds to prevent overheating. 6. Once the chocolate is melted and smooth, use dipping tools or a fork to dip a ball into the melted chocolate, covering it completely. Remove it from the chocolate and tap the fork against the bowl, then drag the bottom against the lip of the bowl to remove excess chocolate. Place the dipped candy onto a tray lined with foil or waxed paper, and sprinkle the top with coconut while the chocolate is still wet. Repeat with remaining candies and chocolate. 7. Refrigerate the candies to set the chocolate, about 10 minutes. Once set, German Chocolate Truffles can be served immediately, or stored in an airtight container at room temperature for up to a week. For best taste and texture, serve them at room temperature.